Backing: Conventional Back–Provides fielding flexibility.. Material: Composite–Designed to offer the look and feel of leather.. Webbing: Basket Web®–Patented web by Rawlings® that is formed by interwoven leather strips to provide strength, durability, and flexibility..
Age: Youth. Model Number: PL91PB. Position: Utility. Every future all-star has to start somewhere, so outfit your beginner with this Rawlings® girls’ Players Series™ 9-inch tee ball glove. It’s designed with a durable composite shell that doesn’t require a ton of break-in time and a Basket Web®, which is extra easy for smaller hands to squeeze shut. 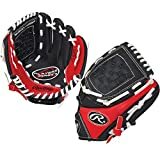 This entry was posted in Baseball and tagged Glove, Players, Rawlings, Series, Youth by FPSports. Bookmark the permalink.